Part three of the squid series. Another fantastic day for fishing, conditions were calm and perfect for jigging. I found that when I ripped the jig through the water, I would see 3, 4 sometimes even 5 squid follow the jig up towards the surface of the water. This only seemed to happen when the squid were hungry, and in this case they were. 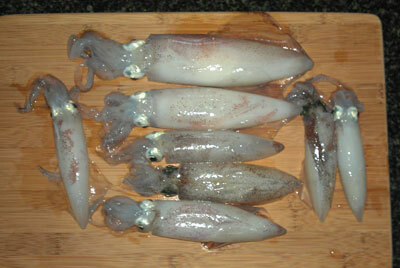 We ended up with 8 squid. Remember to face the squid away from you as you land the squid so that the ink would shoot away as its tail hits the ground!